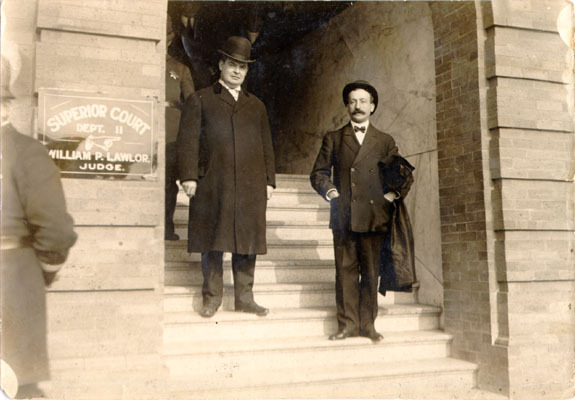 Abe Ruef on the steps of Superior Court, n.d.
Abe Ruef on courthouse steps. Mayor Eugene Schmitz (left) and Abe Ruef in cockier days. Abraham Ruef was born in San Francisco September 2, 1864, a short decade and a half after its explosive growth at the outset of the Gold Rush. He graduated at age 18 from UC Berkeley and went on to become an attorney. Though he never actually held any elected office himself, he made his name as San Francisco's most notorious political boss. He got his feet wet in local politics by entering the Republican Party machine in the late 1880's. Within a few years Ruef had built his own patronage empire by systematically participating in neighborhood associations, ethnic clubs, and so on, doling out contributions and payments along with the provision of services he could provide such as leniency from local judges, approval of business licenses, etc. After some years of patient participation in the Republican Party, Ruef was disappointed in his attempts to take over the local party organization in 1901. Coincidentally, the failed 1901 waterfront/teamsters strike led to a rising movement among local unions to start a political organization, which became the Union Labor Party. Ruef saw an opportunity to exploit the new organization for his own political designs. 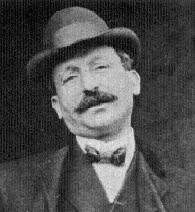 When his legal client Eugene Schmitz, the president of the Musician's Union, became favored as the mayoral candidate of the new party, Ruef threw himself into the new party's campaign, and gave Schmitz the strong push he needed to accept the nomination. Ruef went on to write the Union Labor Party's platform, and built a strong, behind-the-scenes network of support. 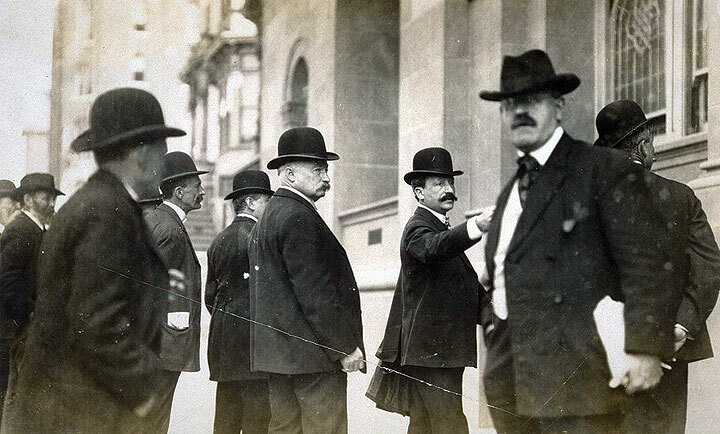 The Democrats had held power during the three consecutive terms of James Phelan's mayoralty, but had lost public support for Phelan's reform agenda when he used the police to protect strikebreakers during the 1901 strike. The Republicans were generally seen as the party of the Southern Pacific Railroad and its allies. Ruef shrewdly gained the unannounced support of the liquor industry, which included over 1,000 saloon keepers as well as another 1000 bartenders, and also had invisible influence over political discussions which commonly took place in taverns across the city. Schmitz narrowly won the election and began the period of so-called union rule in San Francisco politics. Analysis of voting patterns during the period 1901-1912, during which the Union Labor Party won many elections, shows consistent patterns of working class electoral strength underpinning the ULP's success. Middle class support was also substantial, with the remainder split between Democrats and Republicans. A convincing majority of San Francisco felt more comfortable with elected leaders who pledged to protect the interests of the working man against big business and corruption. The fact that the elected officials of the Union Labor Party were enormously corrupt does not change the intentions of their constituencies. Abe Ruef was an unpaid attorney for the mayor's office, but everyone knew he was the power behind the throne. He wrote most of the mayor's official papers and conducted an ongoing series of meetings with Mayor Schmitz, city commissioners, officials, seekers of favors or jobs, and so on, all from his offices at California and Kearny, now the site of San Francisco's current power brokers, the Bank of America. With his new political power, Ruef's law practice prospered as new clients hired him even when they had no use for his legal services. The first such arrangement was established by Theodore V. Halsey, confidential political agent for the Pacific Telephone and Telegraph Company (which eventually became today's AT&T). He began delivering $250 a month in cash to Ruef, not to conduct court cases, but ostensibly for advice on matters of municipal law. Such understandings became the norm, and Abraham Ruef became a name synonymous with municipal corruption. Ruef developed a system whereby he would solicit payments for legal services (which would never be rendered as such). Depending on the scope of the payee's interests, the amount would vary from a few thousand to hundreds of thousands. Ruef would divide the money in half, pocketing his half, and passing the rest on to the Mayor and his ally on the Board of Supervisors (James L. Gallagher), who would then divide the amount among the 16 Supervisors who were on the take. When a specific decision needed to be taken, Ruef would inform his colleagues in a private caucus meeting prior to the open Supervisors' meeting. At the public Supervisorial meeting, the debate would be pre-arranged and Ruef would even coach individual supervisors on what statements to make in order to ensure the appearance of independence and give the individual a chance to go on record against what he ultimately voted to support. After several years of slowly building this system up, much to everyone's surprise, the Union Labor Party, in spite of major opposition in the daily press, defeated a fusion ticket of Democrats and Republicans in the 1905 municipal elections and swept to complete control of the Board of Supervisors and re-elected Schmitz. Then the corruption became much more systematic. The Union Labor Party Board of Supervisors in 1905, all of whom were on the take. PG&E: In 1905, shortly after the new Union Labor Party Board of Supes took over, the Pacific Gas & Electric Company finished its consolidation and merger of all the gas, light and power companies of San Francisco and all central California. One of the new company's largest stockholders was Frank G. Drum, who employed Ruef as confidential attorney for PG&E, offering a retainer of $1,000 a month while sitting in the offices of William S. Tevis in the Mills Building. (Drum was also a board member of the Pacific States Telephone & Telegraph Co.) The Board of Supervisors had the right to set gas rates on an annual basis and the ULP platform had declared that the rate would be rolled back from $1.00 per 1000 cubic feet to 75¢. Shortly before the vote a fire destroyed a major substation, so Ruef thought to ask for an 85¢ rate, but several Supervisors needed good reason, i.e. money. Ruef asked Drum for $20,000 which Drum delivered soon thereafter in currency. PARKSIDE REALTY COMPANY: This was a large real estate subdivision comprising 20% of the future Sunset District south of Golden Gate Park, west of Twin Peaks, in what were then barren sand dunes. The Parkside Realty Co. was organized in July, 1905 by a group of investors led by William H. Crocker, son of Big Four Charles Crocker and president of The Crocker Bank. Quietly purchasing lots from a variety of owners (including Ruef), they put together a 400 acre parcel, five blocks across and 20 blocks long, a mile south of Golden Gate Park, and reaching to within a block and a half of the Pacific Ocean. The Parkside group needed a franchise to build a mile-long streetcar line to feed into United Railroad's line along the south side of GGP, which in turn connected with the city center. The Parkside Co. spent considerable effort trying to woo the votes of the Supervisors, but got nowhere, largely because the Supes were waiting to be assured of their cut. "How much money is in it for us?" asked Supervisor Dr. Charles Boxton, at a banquet arranged by the Parkside Co. (but not publicly revealed until 1910). The Parkside Company decided to employ Ruef for $30,000 for two years, to which Ruef agreed, but only $15,000 was ever handed over. The Supervisors voted to grant the trolley franchise, but Ruef never passed any of this money along. The matter was later halted by the graft prosecution. HOME TELEPHONE COMPANY: Ruef accepted $125,000 to provide a favorable vote on the request for a competitive franchise to provide telephone services to San Francisco, utilizing the new dial phone technology, which the Bell System's local franchise Pacific States Telephone & Telegraph Company, did not yet have. Meanwhile, shortly after the ULP election victory in 1905, PST&T had increased their monthly payments to Ruef to $1,200. Pacific States' political agent Halsey was also paying money directly to the Supervisors at the same time to vote against the Home Telephone Company franchise. Ultimately Ruef was able to get the Board to vote in favor of the Home proposal, even though an additional $51,000 had been paid out by Halsey to various Supervisors who met him in an unfurnished office in the Mills Building. Ruef kept about $33,000 for himself and doled the rest out according to a complicated formula to the Supervisors and Mayor Schmitz, based on who accepted PT&T money and who had offered the greatest cooperation and/or obstruction. OVERHEAD TROLLEY LINES & UNITED RAILROADS: About half of the streetcar lines had been converted to overhead trolleys by 1900. But there was strong sentiment in SF against overhead lines and in favor of placing them in underground conduits, which would cost a lot more. In 1902, United Railroads began making regular, secret payments to Ruef as a special consulting attorney. These payments were made by Tirey L. Ford, who at the time was also the Attorney General of the State of California, a position he continued to hold for several more years while he was also general counsel to URR. By the time of the 1905 election victory, URR was embroiled in a bitter fight with Rudolph Spreckels and James Phelan over the issue of overhead trolley lines along Sutter Street where both men owned property. URR's Calhoun made attempts to buy their support with promises of support for more parks and improvements along Golden Gate Park's Panhandle, where ex-Mayor Phelan owned significant property, but both men continued to oppose the overhead trolley plan and insist on more expensive underground conduits. URR increased the monthly payments to Ruef from $500 to $1000. After a series of meetings in which Ruef proposed that URR should pay for ornamental street poles and the electric lights along the routes they wanted to run their trolley lines, an agreement was struck between Ford and Ruef by which URR would pay for ornamental poles along Market and Sutter to Valencia and Van Ness respectively, but not the lights or power. Ford then offered Ruef an additional fee of $50,000, which Ruef refused, negotiating instead for what was ultimately agreed to be a fee of $200,000 when the work was completed (i.e. the vote of the Supervisors). The Spreckels', Rudolph and father Claus, filed incorporation papers for the Municipal Street Railways of San Francisco on April 17, 1906, in order to prove that underground conduits were economic and superior, and to bring pressure to bear on Calhoun to give up his resistance to undergrounding the electrical lines. The next morning at 5:14 a.m. the famous earthquake and fire struck, destroying most of San Francisco. Within the next year, the graft prosecutions would begin and the heyday of the Ruef Machine would come to an end, leading ultimately to Ruef's incarceration in San Quentin for about 5 years. P.H. McCarthy, head of the Building Trades Council, won the mayoral race for the ULP in 1909, and ruled for one term.